I have a fab little beauty offer to share with you today – Harvey Nichols are currently offering an awesome free gift to customers who spend just £29.00 or more on Lancôme products! In the decade since it launched at London Fashion Week in 2005, the ROKSANDA fashion house has evolved an unmistakable woman-centered design aesthetic. Sophisticated and feminine yet playful and effortless, its iconic ready-to-wear and accessories are instantly recognisable to the burgeoning community of international customers who enjoy them for their contemporary distinct impact and enduring appeal. Today the label is stocked in over 40 countries worldwide, offering women’s ready-to-wear, jewellery and bags as well as the children’s wear line BLOSSOM. Designing from her London studio Roksanda uses the finest materials and craftsmanship, producing her goods in the UK, France and Italy. 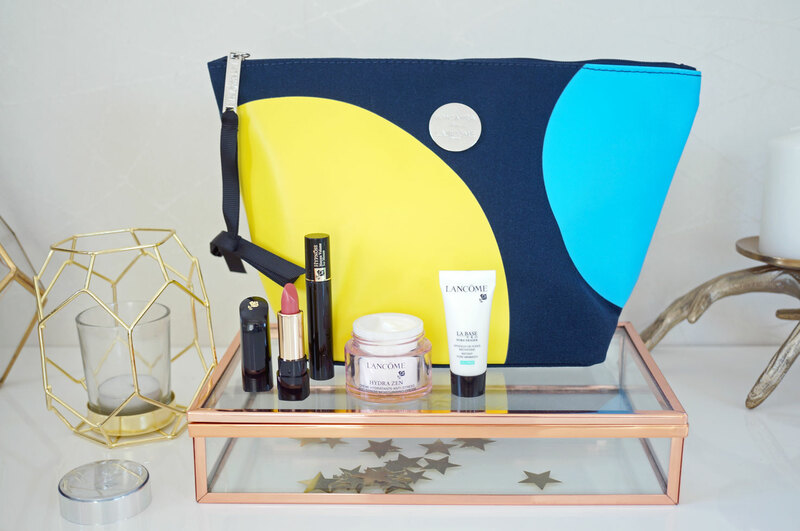 An exclusive Roksanda for Lancôme Paris makeup bag. Lancôme Hydrazen Anti Stress Moisturising Day Cream SPF15, 15ml. Lancôme La Base Pro Pore Eraser, 5ml. Lancôme Hypnose Volume Mascara 2ml. Lancôme L’Absolue Rouge BX06 Lipstick, 1.65ml. This is a fantastic way to get your hands on some Lancôme minis – which are perfect to try before you buy full sized products, or handy to take with you when travelling. T&Cs: This promotion is available to UK customers only. The offer will end on 08/06/16. Promotion available instore in Harvey Nichols Knightsbridge, Birmingham, Leeds and Beauty Bazaar Harvey Nichols. Customers shopping instore must purchase Lancôme products totaling £29.00 or more to qualify for promotion. Purchases must be made at the same time and in one transaction. Offer extends to one gift per transaction regardless, even if spend is over £29.00. My Friday Night Pamper Sesh!